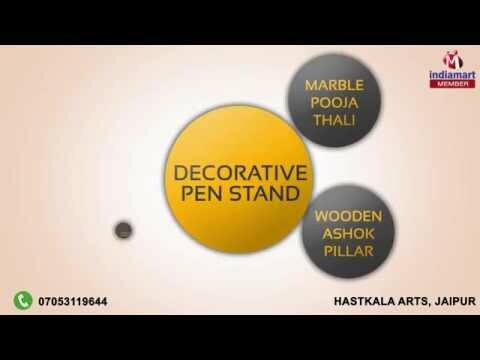 Welcome to Hastkala Arts, established in the year 2014, we are top most manufacturers, suppliers, traders, retailers and wholesalers of a wide range of Handicrafts Items. Inclusive of Marble Watches, Decorative Pen Stands and Marble Pooja Thali, we offer a wide range of products. To design the offered range of marble gift products as per the prevailing market trends, our designers make use of the finest quality marbles that are procured from some of the trusted vendors of the industry. Their impeccable finish, contemporary appearance, elegant design and durable construction, makes these marble gift products highly demanded for commercial & personal gifting & decorative purposes. Backed and supported by a team of innovative and creative craftsmen, we have been able to cater to the precise needs of our valuable patrons. Boasting on a very congenial workplace, we work to attain maximum customer approval.